€10 Per Person will be added to the booking for Bed Linen. 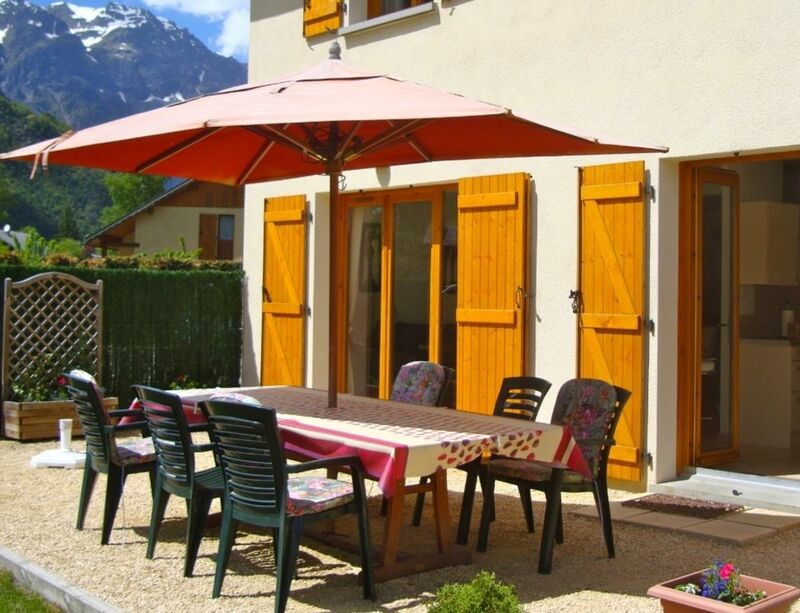 The house is well located in the village of Bourg d'oisans, at the base of Alpe d'huez. Walking distance to the village and local amenities and next to the outdoor communal pool, tennis courts, bouledrome. Self Catering, Summer, Winter Holiday. Family home, 3 bedroom, furnished to a high standard. The attractive house has a modern fully integrated kitchen, well equipped, dishwasher/microwave. Open plan living space with comfortable lounge seating for 6 and dining area with comfortable seating for 8. French doors lead to the rear, offering stunning views of the mountains (seating for 8). Bedroom 1 double (sleeps 2). Bedroom 2 (sleeps 2), two singles. Bedroom 3 (sleeps 4), 1 set bunks and 1 single with hideaway bed beneath. ALL BEDS are comfortable for adults. 1 bathroom containing bath, toilet and sink, shower room, additional toilet downstairs. Washing machine, garage and parking. Getting to Bourg D'oisans: Grenoble Isere is the closest airport approx 1 hour drive from Bourg d'oisans. Ryan Air, Easy Jet and British Airways all fly there. Flights are more regular in the winter season. Grenoble is a small hassle free airport, however, if you want more flight options, Lyon is about 90min away from Bourg d'oisans. It is better to pre book car hire at Grenoble airport, however if you wish there is a bus to Grenoble bus station, where you pick up a connecting bus to Bourg d'Oisans. A drive from Calais takes about 8 hours. Buses from Grenoble to Bourg d'oisans. Times available at tourist board. Take a break: Discover the village of Bourg d'Oisans especially lively in the summer. Mix with locals and holiday makers in the little bars and restaurants. Don't miss the year round Saturday market - a great choice of outstanding cheese, fresh vegetables, bread, cold meats and much more! Visit pretty cobbled Venosc village, and afterwards go and watch white water rafting at St Christophe. Visit the chateau at Vizille and Uriage Les Bains with its health spa and quaint shops and cafes. Spend a day in Grenoble, take a tram ride, scenic cable car, shop in the pedestrianised area or visit the museums. Take a day trip to Italy or the pretty fortress town of Briancon. Take a cable car from Alpe d'Huez to top of Pic Blanc 3303m, the views are amazing! Visit La Grave and the ice cave. Enjoy excellent food at some of the alpine restaurants in Alpe d'Huez orr Les Deux Alpes, our favourite is the Altiport in Alpe D'huez. Centre of Activity for adults and Kids: Swimming: Kids have a choice of pools; in the summer communal pool/water slide in Bourg; a great indoor pool at Vaujany with lane swimming, water slide, kids pool and spa area; two pools at Alpe d'huez indoor and out. Kids also love trampolining, ice skating, summer village activities and the adventure park. Cycle touring: ride roads and passes of Oisans: the famous Lautaret, croix de fer, Galibier and Glandon passes. Hiking: well known walks to several day long treks, more than 800km of path await you, itineraries for all. Mountain bike: discover a wide range of trails and runs, over 40 marked itineraries. Fishing: good fishing areas with top-grade streams, torrents, rivers, two dams and numerous mountain lakes. Golf: play 9 hole golf in Alpe d'Huez or Les Deux Alpes or 9/18 holes at the good quality courses around Grenoble. Skiing: Just a 15 minute drive to Alpe d'Huez, 25 min to Vaujany and 30 min to Les Deux Alpes. Plenty of free parking at all resorts. There is a hand held shower in the bath in full bathroom. An additional downstairs toilet. WIFI. Facilities include a brand new fully integrated kitchen, well equipped with kettle, coffee maker, washing machine, FREE SAT TV, DVD player, (bring your own DVD's), hair-dryer, books and games. Linen is provided at £8/10 euros per set. The house was perfectly located for us. A short walk into the centre of town, and very easy access to the mountains for the cycling. The house was in excellent condition (almost brand new) and very well equipped. It had parking for the car and a garage to store the bikes. We had a really lovely stay at this beautifully maintained and well-located house. It was perfect for our needs, a location at the bottom of the famous 21 which we drove up each day to ski at the resort of Alpe d'Huez (only a 15-20 min drive). The house is furnished really comfortably in a contemporary style. A huge log burning stove created a warm and cosy atmosphere after a long day's skiing. The kitchen was really well-equipped with every implement and cooking utensil we needed. The beds were very comfortable. There were fantastic instructions and Sue and Jamie, the owners, were excellent with advice and answers to our questions. The house is kept to a really high standard and we found it to be spacious for 3 adults and 2 teens. We could easily have fitted in another 2 teens and one more adult. There was plenty of hot water for showers and baths. It was lovely to have lots of board games and books to borrow. The description of the property and its facilities are really accurate and we would highly recommend this property, in fact we are hoping to book again ourselves for a summer trip. We had a brilliant holiday in the alps and the house was amazing. There is nothing bad to say about the house at all only good things. The house has three good size bedrooms and a great kitchen and good size lounge. There is a lovely garden too which we were lucky enough to enjoy breakfast in every morning. The location of the house is excellent too - you can see the top of alpe duez from the front door and over the road is a very good swimming pool which we went to every day. Overall 10/10. Already booked to go back !! From the start Sue and Jamie were amazing hosts. I had quite a few questions and Sue was more than happy to answer them. On arrival to the house we were blown away by the views, and the house was just as wonderful. I really loved the decor, and the quality of the furnishings were second to none. Our children were very pleased with the variety of toys and games. The layout of the house was very well thought out from top to bottom with everything you could possibly need right at your fingertips. To sum it up - we felt at home here and by the end of our week long stay had already decided to come back again, i would not hesitate to recommend this property to any of my friends and family (which i have already done) and we can't wait to go back ! Thanks Sue and Jamie !! Fantastic house - Ideal for cycling trips. I stayed here with a group of cycling friends in June and we found it to be an ideal house for the purposes of our trip. Located no more than 400m from the base of Alpe d'Huez and a short distance up and down the the valley to reach many other Col's, it was an ideal starting point for a days cycling. The house is modern and extemely well presented with everything we required for our stay. There was also an adjoining secure garage which provided more than enough space for storing 7 bikes and bike bags. Only a 5 min walk to the large Casino supermarket, and 5 mins to the centre of town where there's a variety of restaurants, banks, and shops (inc. bike shops). A great house in a great location - would highly recommended. Stayed here for a one-week holiday of cycling/hiking/swimming - for which Bourg d'Oisans is a perfect base. The house is fantastic, and the owners provided a travel cot, high chair and toddler toys for our 16-month-old son. The unexpected addition of CBeebies was also a big treat! Highly recommend. A paradise of activities winter & summer: walking, climbing, skiing, horse riding, cycling, rafting, canoeing, swimming, fishing, golf, parapenting and adventure park. Cyclists choose VTT or road cycling, close to the famous tour de France climb up to Alpe d'Huez. Walk to the pretty village of Bourg d'Oisans with its river running through. Bourg d'oisans has several restaurants, cafes, a large renovated supermarket and busy year round Saturday market. Next to summer open air pool with toddler pool, water slide and grass area for picnics. Join in the village activities. Visit the quaint cobblestone village of Venosc. Take a day trip to the walled fortress town of Briancon or historic Grenoble with its trams, shops and museum. You are well placed to select the 'best snow' in winter. EASY access with plenty of free parking at both high resorts Alpe d'Huez and Les 2 Alpes and the pretty tree lined resort Vaujany. You are also 1 hour away from the delightful resort of Serre Chevalier. Ski: Well placed to select the 'best snow'. We are at the base of Alpe d'Huez, just a 15 minute drive to plenty of free parking by the slopes in Alpe d'huez, 20 mins to Vaujany and 30 mins to Les Deuz Alpes. The area is the 5th largest ski area in France, benefiting from a variety of pistes for skiers, snowboarders, walkers and ski du fond. In addition the lovely ski area of Serre Chevalier is just an hour away. In Alpe d'Huez advanced skiers should try the challenging 'tunnel'? Alternatively enjoy one of Europe's longest runs Sarenne, 16km of piste, or test your skills in the snow park. Lift passes are available at each resort. We recommend you hire a car, however, if you don't want to drive, in winter a bus service is available check with the tourist office for times.